Five people were seriously injured when a minivan overturned after hitting a tree in the central reservation on Petchkasem Road in the Kao Yoi area yesterday. 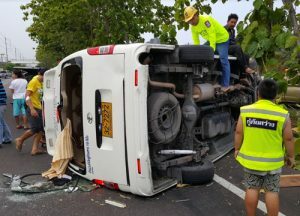 The Thai driver Mano Hormrareun, from Nakon Pathom was one of two occupants of the vehicle that had to be cut free of the wreckage. He suffered a severe leg injury, reported Sanook. The South Korean family were named as Taewook Kim, 37, Min Sun Ji, 41, Donghyun Kim, 8, and Siyeon Kim, 5. All the injured were taken for treatment at Khao Yoi hospital. Driver Mano blamed a car that cut in front of him causing him to lose control. He was taking the Koreans from Hua Hin to Suvarnabhumi Airport.